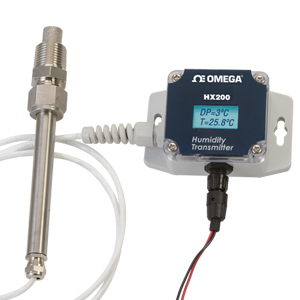 The HX200 is a high accuracy calibrated dew point or humidity transmitter. The remote sensor is designed to work at temperatures as high as 200°C. This high accuracy sensor is also built to withstand up to 51 bar. These transmitters are perfect for applications such as compressed air, dryers and environmental chambers. Nota: Comes complete with probe, transmittter, user’s manual and NIST calibration certificate [calibration done at -60°C (-76°F)].